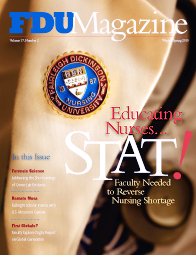 The nation is facing a shortage of nurses, coupled with an increased demand for health care. Find out how FDU is addressing the challenge. The Campaign for Fairleigh Dickinson University is nearing its $50-million goal. FDU’s Institute for Forensic Science Administration is applying the principles of economics and business to examine flaws in forensic science. Ramatu Musa, BA’09 (T), interned at the U.S. Mission to the United Nations in Geneva, Switzerland. FDU Magazine shares her summer travelogue. Pollster John Zogby has declared America’s youth to be the first global generation. Are they? FDU’s experts comment. amatu Musa, BA’09 (T), is on a global learning adventure. 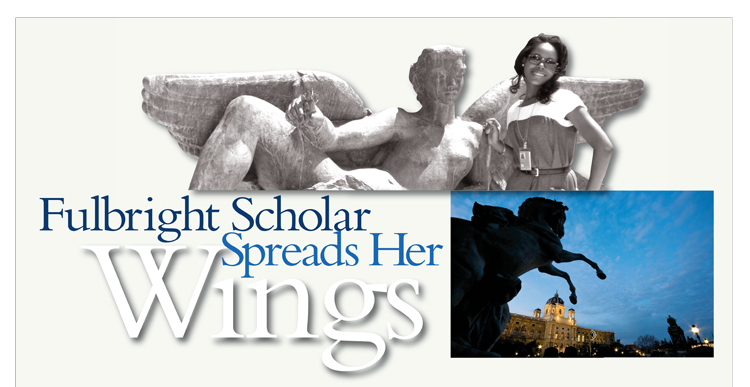 She was selected for a Fulbright scholarship to spend this academic year in Israel. But before that could begin, she held a coveted summer internship with the press and public affairs office of the United States Mission to the United Nations in Geneva, Switzerland. Musa spent the summer arranging conferences, conducting research for U.N. publications, hosting visits by American students studying abroad and enjoying some enviable cultural excursions. She shared her summer experiences through a travelogue on FDU’s Web site (www.fdu.edu/fulbright), and excerpts appear below. We will feature a video specially created by NASA for the anniversary, as well as host two guest speakers: An American representative from NASA and a Swiss space expert. I will be working with the public affairs cultural assistant and the economic and scientific affairs section as well as consulting with my superiors in order to make the event happen. I quickly jumped on the project. To begin, I got in touch with the NASA officials in Washington, D.C, to facilitate the production of the video. Next, I drew up a potential list of invitees: people from the scientific community at Université de Genève and École Polytechnique Fédérale de Lausanne; foreign missions that have cooperated with the United States on manned space explorations; physicists at CERN [the European organization for nuclear research]; local press; prominent Genevois; and NGOs [nongovernmental organizations] with interests in scientific affairs. After much preparation and planning, we hosted two speakers — Daniel Neuenschwander, director of the Swiss Space Office; and William Barry, NASA’s representative in Europe — who gave an excellent talk about the future of manned space exploration and the importance of transnational cooperation in these efforts. The highlight of the evening was the anniversary video. The room fell completely silent as we relived the day when the genius of mankind placed a man on the moon. I visited Schönbrunn, a baroque palace with beautiful gardens, a zoo and the Gloriette — a lovely pavilion up the hill. Walking through the palace and breathing in such splendid history was a phenomenal experience. The next day, I visited Schloss Belvedere, another baroque palace. Now a museum, Belvedere was built by Prince Eugene of Savoy and is most famous for housing Gustav Klimt’s golden paintings. The grounds were spacious with manicured gardens, fountains and winged statues. On my last day, I took the tram to downtown Vienna without a map, a clue or any knowledge of German. First, I went for a tour of the Kunsthistorisches Museum. Next, I strolled past the famous Vienna state opera house. Visiting Vienna was such an amazing and educational experience. I saw Austria’s national treasures up close and got a peek into Viennese cultural life. I came back to Geneva even more convinced that the world is in dire need of more cross-cultural exchanges. We went to the WTO to brief a prospective participant about the International Visitor Leadership Program (IVLP), which brings foreign professionals to the United States to meet their American counterparts. Later in the week, we visited the communications and public affairs team at the ILO. Extracurricular activities included a tour of CERN, the biggest particle physics laboratory in the world … situated at the Swiss-Franco border on a huge complex. About 7,000 scientists from more than 80 countries work together at this fascinating place to crack the hidden code of our universe. … Touring the facility was incredibly humbling. The world’s best and brightest — the most intelligent minds — are concentrated in one place, collaborating for our collective evolution. It was too overwhelming to comprehend. I came back feeling very challenged to think about what I can do with my life to contribute to the human race. My own supervisor is out for three weeks, and the public affairs counselor is enjoying a weeklong retreat in the French countryside. It is just me, three other colleagues and the computers. … Our office hosted 30 undergraduate students [from UCLA] who are here studying at the University of Geneva for a presentation on U.S. Mission affairs. I and the other interns hosted a fun panel on what life is like as a U.S. Mission intern. The group was delighted to hear about the priceless benefits of an overseas internship. My supervisor asked me to compile culturally sensitive content for a new newsletter called Reflections on Muslims in America. The mission of this public diplomacy endeavor is to highlight the contributions and achievements of American Muslims. We have set a launch date to coincide with the first day of Ramadan. To start, I divided the content into three categories: articles, cultural publications and art exhibitions. Without a doubt, the Islamic newsletter is the most engaging and exciting thing I’ve worked on. As a Fulbright Scholar [this fall], my mission [will be] to promote a cross-cultural understanding between foreign nations and America. Putting together the content for this newsletter could not have been a more perfect assignment. Once completed, the publication will be sent to over 700 members in the Islamic diplomatic community in Geneva. How’s that for cross-cultural understanding? My supervisor absolutely loved the draft I created for Reflections on Muslims in America. After he added his needed edits, we sent the newsletter to the deputy chief of mission, who loved it and was very complimentary about the content and aesthetic design. Saying that I am feeling proud and accomplished would be a gross understatement. My second-to-last weekend in Geneva was bittersweet. I explored [Rue des] Pâquis, the main boulevard in town. Here, you see the opposing facets that make the city a gem. On one corner you find cheap Lebanese counters selling delicious but questionable kebabs, and on the next turn luxury shops with $10,000 watches. At the dock by the Jet d’Eau, immigrant families from Albania, Ethiopia, the Philippines and South America happily congregate against Lake Geneva and its luxury yachts. Barcelona was alive. The city had an energy and vibrancy that reminded me of my beloved Sierra Leone. I loved it. Antoni Gaudí, Barcelona’s late, innovative architect was everywhere. … My first visit was to his La Sagrada Família, a huge Roman Catholic Church with ceilings carved into honeycombs. The building defied every classical model of style and taste. Gaudí went against the grain and drew inspiration from nature: leaves, trees, bees, birds, reptiles and even the human body. The next day I took a train to Girona to see the old Jewish quarters. During the medieval ages, Girona was a vibrant center of Jewish life. El Call, Catalonian for “Jew,” is the name of the historic neighborhood. The city had tiny well-preserved streets and an eerie quietness. The Spanish Inquisition definitely left its mark. The only remaining trace of Jewish life was a museum that housed treasures such as old gravestones, Torah covers, jewelry, women’s dresses, Ketubah (wedding contract) and other priceless artifacts. … On my flight back to America, [I reflected on my last 12 weeks]. The people I met, the places I saw and the experi- ences I have had transformed me. I come back with a different brand of confidence about who I am and where I am going. I will forever be grateful to the special people at FDU who took an interest in my potential. They challenged me out of complacency. They made me curious about the world and my role in shaping it. Thank you. FDU Magazine welcomes your comments. E-mail Rebecca Maxon, editor, at maxon@fdu.edu or make a blog entry at MyFDU.net.